Francine and I are very familiar with this campsite. It has become one of our firm favourites, both from a quality of site and basic interest points of view. Our hosts are dairy sheep farmers, Luc and Nadine, and, besides the wildlife that lives in and around their lake (used for watering crops in the dry season), they have a herd of 320-ish ewes whose milk is collected for the production of Roquefort cheese. Luc and Nadine are great hosts who hold aperitif evenings for their camping guests. In turn, we are fascinated watching the day-to-day business of their farming. Today was market day in nearby Bram. Bram is a fascinating town whose shape cannot be fully appreciated other than from the air. It is circular radiating out from a central square but we land-lubbers cannot really do it justice. You have to buy a postcard. Some markets in France seem to target tourists in particular but the market at Bram seems to be targeted more at locals. Tourists aside, French markets are always very well attended and it is quite surprising how much of their weekly produce some folks actually buy at them. 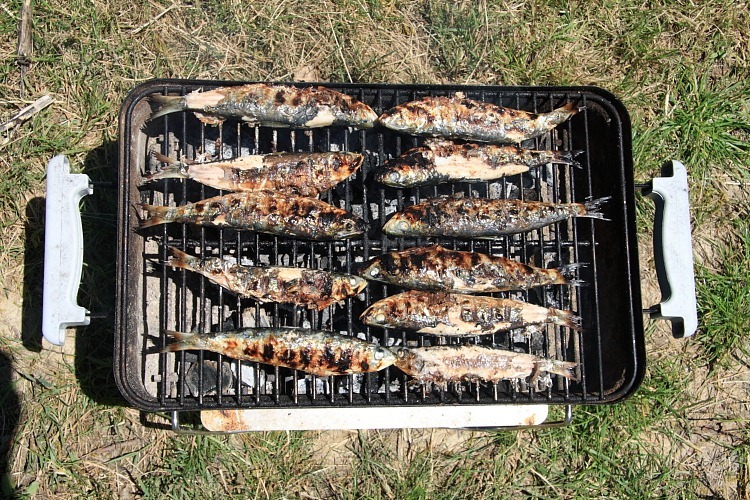 Having been starved of good barbecue weather of late, Francine and I couldn’t resist buying some sardines to grill for lunch. We have, after all, got one of France’s finest sites for a pique-nique right on our doorstep. The land that Luc and Nadine farm, together with one of their sons, Cedric, is mainly used to grow fodder for their sheep herd. In the summer the sheep are allowed out into the fields to graze but in the winter they are kept in a barn, the bergerie, where they are fed on a mixture of hay, barley, and luzerne (alphalpha). Luc and Cedric had been busy cutting some of the fields of luzerne and turning it to dry a little. At today’s evening aperitif session, Luc told us that he was going to be making a noise tonight, to compete with the frog cacophony, baling one of the fields of cut luzerne. 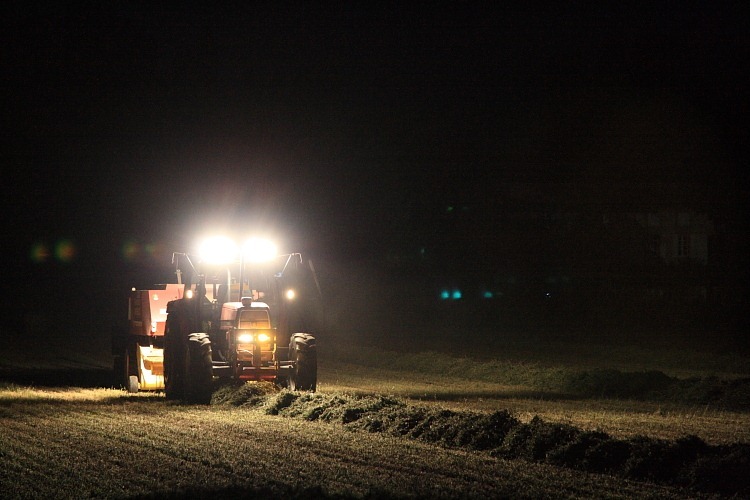 Baling work would start at 10:00 PM. This was a new experience for us and we were keen to stay sober enough (very difficult) to try and take photos of their night farming activity. Francine used the tripod and time approach while I tried with my flash gun. Not wishing to be run down by a baler (and Luc was anxious not to run us down with a baler), we stood at a safe distance – so safe that my flash really wasn’t powerful enough. After a few trial shots, however, Francine had much better success with the timed tripod approach. Luc likes to have copies of our pictures and I’m sure he’ll be happy with this addition to his collection. Never believe anyone who says that farmers do not work hard, even French ones.